Congratulations to your election! Be assured that starting from March 2nd on you will go through one of the most fascinating periods of your life. First of all and for a good start: Enjoy Europe! The program gives you the unique chance to visit Paris, Milan and London, three most fascinating cities and their excellent universities, Sciences Po, Bocconi and SOAS. I really hope that the financial crisis and the recession will not impair your journey. For London at least it might be even an advantage as the Euro is now so strong against the British pound. I have some pieces of advice for you that I didn’t want to write into the so called Blue Book of ETP alumni which is very useful though. Let’s start with another book. I would like to propose you, or better: urge you to read Dogs and Demons. 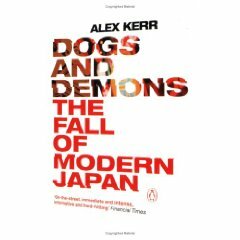 The Fall of Modern Japan by Alex Kerr. JT: You have also been very critical of academics experts on Japan? I know that this is like party-pooping, but a book like this will maybe help you when you start feeling that reality is something different in Japan, for example how the Japanese economy makes – very successfully! – money out of nothing and defies all western economic theories. Another fascinating aspect of Japan is the unique and powerful online platform 2 Channel called “ni-channeru”/ 2チャンネル on http://2ch.net. It’s not only the biggest of its sort in the world, it is also one of the rare examples of civil disobedience in Japan. On 2ch everybody is anonymous. This has released an incredible energy in a country where everybody is basically shy and hiding his or her thoughts and where official statements of people, companies and institutions are full of lies. Thus this mega-blog has attracted lots of criticism and even more lawsuites. This extremely successful and controversial online forum was many times just about to be shut down, but the authorities didn’t manage it. My wife told me that she first goes to 2ch when an actress dies from drugs or a child is killed by one of the many insane guys around (this is a big issue) because all the facts are there within minutes. And it’s much more than newspapers disclose – journalism in Japan is generally very poor. In January 2009 its founder Hiroyuki Nishimura, one of Japan’s strange and lonesome online heroes, has sold 2ch to a company in Singapore; read more about this here. It’s also good and interesting stuff for one of the many presentations that you will have to make. You will learn about “Densha Otoko”, the most romantic story of the “Train Man” which ended in a famous printed book and started a whole new genre of literature. How it works and the community-specific vocabulary you will find at http://en.wikipedia.org/wiki/2channel. Put stories in your luggage! You can prepare yourself for the language classes at SOAS and Waseda by collecting many private experiences and stories from your home country, village, family and job environment. Be prepared that you need a lot of these stories for Japanese conversation and presentations. Think about food (very important! ), your interests, books and hobbies and be prepared to make full fledged presentations about them with Power Point in front of your class. One of the key practices you will learn is a compelling self-introduction, じこしょうかい (jikoshoukai) which includes personal and business information. Make it interesting! Otherwise you will soon get bored with your own story. Try to find a place close to Waseda in Tokyo! Commuting is terrible and takes your time, something of which you won’t have much! I was living 50 minutes from Waseda, that was too much and I was often exhausted with classes going from 9 a.m. through 5 or 6 p.m or sometimes later. When you are tired, sleep during classes! That’s very Japanese. If you look at Waseda into any classroom you will always find between 10 and 20 percent of the students sleeping in front of their teachers. And that’s what they call their elite! You can show a lot of conaisseurship by taking your ironic revenge this way on ETP for the inflicted pain and exhaustion. It’s absolutely conclusive behavior and I have never witnessed a student being woken up by a teacher. You will see, sleepiness is a big issue in Japan’s daily life. Find more on this topic in my essay on Fatigue in Japanes Business Culture. Make trade-offs! Basically, ETP is too much. It’s too much lectures and too much homework. You will see that you have hardly left any time for independent self-study, especially in Tokyo. Some of us, like myself, tried really hard – at least for a while – to cope with the whole program and to be zealous in all fields equally. It’s impossible. Don’t even try it. Make trade-offs and focus on what is most important – and that’s language. The business part at Waseda is far too big. With lectures, readings and homework it makes at least 60% of the whole schedule, but this stuff will not help you to have a good time in the most important part of ETP, the internship. Forget Kanji! This is especially true for the beginners. It is a waste of time and energy to learn many Kanji in this short period of time (this is obviously different for non-beginners who have studied Japanese before). It is so much more important to learn well and fluent Hirgana and Katakana, even more speaking practice and conversation. And don’t underestimate Katakana as we did! You will be surprised how many words in Japanese are written in Katakana. But basically focus on speaking. Use extensively audio supported learning programs like the one we got in Conversation class 『きくーかんがえるーはなす』i.e. “Hear – Think – Speak”. Japanese for Busy People I-III has also a very good audio support on CD, but we never used it because the teachers just ignored most of the part of these textbooks. I discovered only very lately how well these textbook are made. The teachers are all convinced that JBP I-III are bad textbooks, but the truth is that they made a totally unsystematic use of it. JBP I-III is very good, but how should one know this if teachers never used the main texts, target dialogs and speaking practices? I was angry about this because thus they made us learn vocabulary and kanji by heart that we never used in their context. The lesson learned is for me the fact that Japanese are very bad at teaching languages. They will tell you a lot of stories about different brain physiology and alike stuff in order to explain you why Japanese people after at least six years of learning English are unable to speak a single sentence. Forget it! Japanese teachers – even though they are lovely, dedicated people and make huge efforts in order to make you progress – are just bad at teaching languages. It’s not their day-to-day practice in class that is bad, it’s the systematics and the didactical approach. E.g. you will see how there is an almost complete lack of repetition and rehearsing because of a schedule that makes you learn every lesson a new grammar pattern. This applies even more to language classes at Waseda than to classes at SOAS, the latter being generally better. Japanese teachers have a religious belief in the importance of grammar although ironically spoken Japanese widely ignores these grammar rules and has many rules of its own that you don’t learn in class. 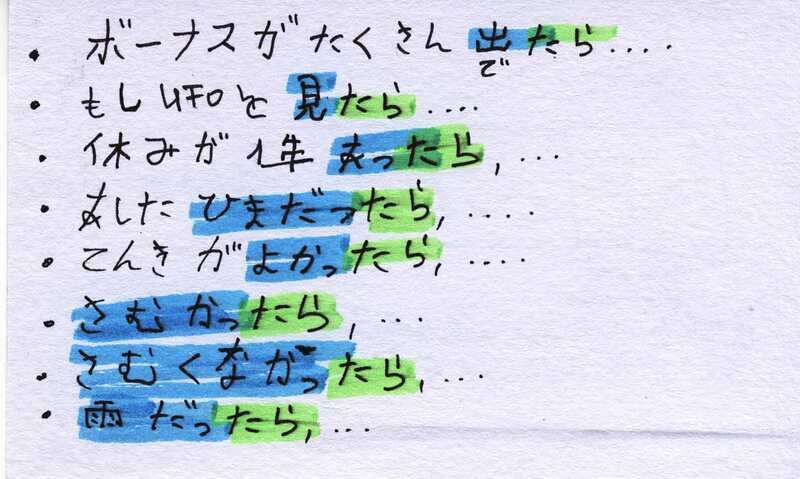 By the way, this difference between spoken and written Japanese is one of the most frustrating experiences because you will see that you cannot apply your achievements from classes in Japan’s daily life. Probably you will work on the textbook『みんなの日本』”Minna no Nihongo” during ETP27 because teachers disliked JBP so much, but watch out because altogether the same applies here. Finally, for the beginners Kanji will not be part of the final exam. Push your teachers to teach you colloquial Japanese! Japanese teachers will only teach you a language that you can use in official and business contexts. For your daily life in Japan they will only be helpful in one out of four cases. With your school Japanese in mostly polite form you sound awkward and stupid in all contexts off business and public speech. With family and friends you cannot talk like that. Even in an office situation like during your internship you should be able to talk in common plain speech. Otherwise you will be treated like an “erai”, an elevated, noble person – which means that everybody makes fun of you and can’t address you in a personal and intimate manner. And this is the reason why Japanese teachers have so much difficulties to teach you “futsuutai” or “kougo”, because they would need to talk to you and let you talk to them as if you were (mostly) her brother, sister or friend. But don’t underestimate your influence on the program, especially in terms of Japanese language. If you push them hard they will start doing it. I had my best private lessons with Murakami-sensei when we started talking like friends, and I learned more than in most of the classes because I could use it right away the same day at home or in an izakaya. Make grammar flash cards! This is a great invention that I only made after all the classes and in preparation of the final exams. You will most certainly use flash cards for Kanji and vocabulary, but grammar flash cards are even much more helpful. They should be bigger than the cards you use for vocab, something like 10 or better 12cm x 5cm. On the front page you write down the general grammar pattern and you indicate the book and the page number where you found this pattern. 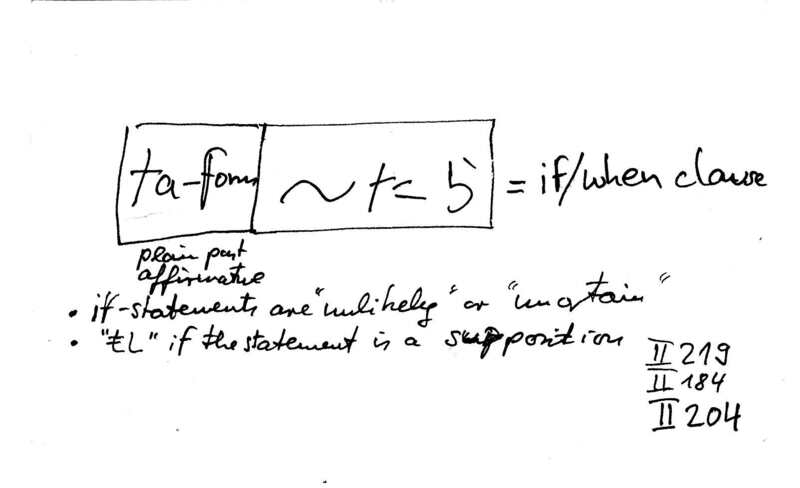 On the back you write some examples. That’s it. Build up a list of all verbs! It is extremely helpful to have a special and separate list with all verbs that you pick up during classes and homework – from the beginning on! It will be a real asset later on in Tokyo. Leave enough space on the right side so that you can add the conjugations that you will learn (-te, -ta, -masu, -n, plain, dictionary, potential, passive, causative, honorific etc.). Why only verbs? Because it is through them that you can grasp the meaning of and the action in a given sentence. Actually conjugation is the biggest single task in learning Japanese because there is – luckily! – no declination of nouns. Thus, every time you have an exam you can rehearse the verbs apart from anything else, i. e. grammar pattern, kanji, vocab. It really enhances your understanding, not only in written texts but also in daily life. I should have done that much earlier, but like the grammar flash cards I discovered this method only by the end of classes at Waseda. Start your business plan asap! To write a business plan is a really big task if you haven’t done it before. Gather as soon as many information as possible because the time left after the internship will be far too short because you will need to prepare the final exams. Don’t miss to visit Gorudengai! More about this here. Don’t hesitate to contact me and please let me know how you’re doing. Good luck, have big fun and find soon your personal equilibrium with this challenging program! Thanks for these advices. It sounds though, but definitely fascinating. I hope we will enjoy it though. Regi, great info thanks mate!I will be starting in 2 months time and I am looking forward to do so. Thanks for this great info! If you happen to be in Tokyo from mid-June ’09 onwards it would be a good idea to arrange a dinner/drinks with some of the ETP 27 participants (through the ETP Secretariat?)! Thank you very much for this post. I’m starting ETP in less than a month and I’m very grateful to your kind advise. Moreover I’m now reading Dogs & Demons and I agree with you in that it’s a great book to challenge all these pretty and idealistic stories about Japan… everything couldn’t be perfect! !